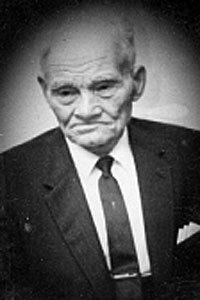 James Joseph Dunn of Russell was born in 1882 in the Minniska district and received his education in the local Minniska School. Mr. Dunn also attended the Manitoba Agricultural College during the winters of 1908 and 1909. Mr. Dunn was a long time member of the Manitoba Hereford Association, having started a pure-bred herd of Hereford cattle in 1927. He was very influential in the development of the Hereford breed, both in and out of the Province of Manitoba. Mr. Dunn showed livestock at the Brandon Winter Fair every year, where they sold to pure-bred breeders and commercial herds. Breeding stock were also sold to all parts of Canada and the United States with some exports to South Africa. Mr. Dunn showed cattle at most western fairs and the Toronto Royal and received a large number of ribbons and trophies for his efforts. In 1963, the Manitoba Hereford Association presented Mr. Dunn with a silver tray in recognition of his contribution to the Hereford Industry. Two years later he was presented with a Certificate of Merit for his promotion of the breed. In 1967, the Manitoba Centennial Corporation presented Mr. Dunn with the Order of the Crocus Certificate Award of Honour, in grateful recognition of services given to the welfare and development of the nation. On the occasion of his 93rd birthday, he was the recipient of the Scroll of Honour from Radio Station CJGX Golden Westerners for his lengthy contribution to good citizenship.